Everyone has that favorite dish that reminds them of their childhood. In many cases, it was some pre-packaged food your mom prepared for convenience, and you might love the memory of it more than you would if you actually ate it today. Or in the case of this one, they simply don't make the boil in a bag chicken ala king that my husband loved as a child. So, I couldn't really do any testing with this one, I just had to go from memory. I am going to guess my version has a bit more chicken than the old school kind. But otherwise, the flavor was very, very close. Once it's complete, you have another dilemma...do you serve it with toast or noodles ? Ray said toast, I wanted noodles, so we did both. Equally good, and this makes amazing leftovers ! Place chicken breasts in chicken stock, and simmer over low heat for 30-45 minutes until completely cooked through. Remove from the stock and cut into bite size pieces (you will want to let them cool a bit to make them easier to handle). While chicken is cooling, add onion to the stock, and increase heat to medium. Cook until onion is tender, about 10 minutes, then reduce heat back to low. In a jar or container, combine milk and flour and shake until well blended. Slowly stir mixture into the stock, to avoid lumps. 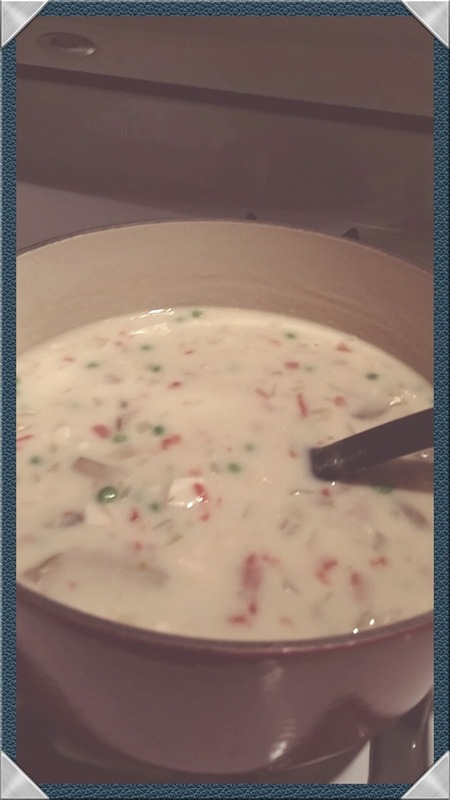 Simmer until the sauce starts to thicken, then add the chicken back in, along with the peas, mushrooms and pimientos. Continue to simmer until the sauce is the consistency you like, and peas are cooked through. Taste, and add salt and pepper as you like. Anyone who knows me knows I am a Food Network addict. There are times when my husband thinks our television doesn't get any other channels ! So, many of my recipe inspirations come from things I have seen on shows there. I especially love the competition shows. 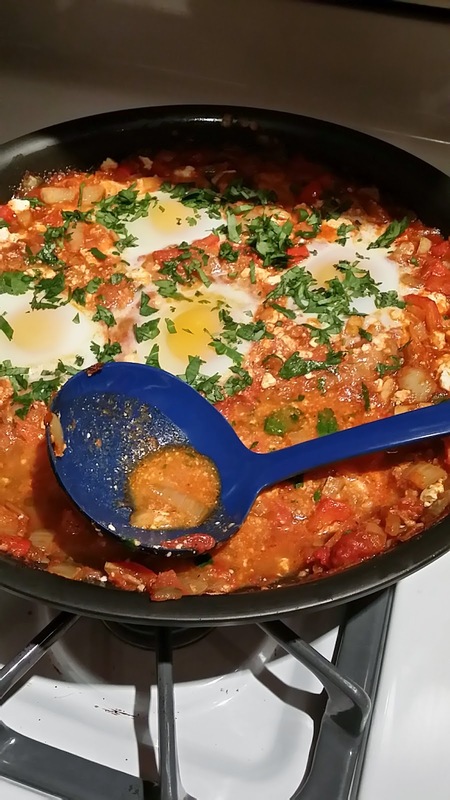 I can't remember on which show I first saw shakshuka, but I do remember it was a breakfast challenge of some sort. I make a similar dish that has spinach and chick peas, but this one seems so much more interesting. And then, it seemed like it was stalking me...it kept popping up on TV, and then suddenly on my news feed, it was everywhere ! So, of course, I had to try to make it myself. I followed a recipe the first time, to make sure I had the technique, then I made it from memory. So, this is my version. Apparently, from the research I did, it is North African in origin, but there are many different versions, with different levels of spice. 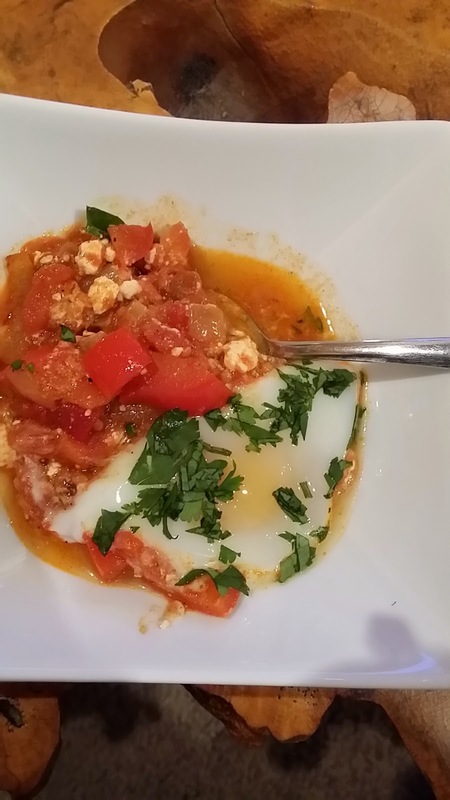 This one was quite spicy, and the feta adds a nice, creamy texture. We ate it for dinner, but you could do breakfast, brunch, it would be good any time of day. Preheat oven to 400. In a large, oven proof skillet, heat olive oil over low heat. Add onions, red pepper, serrano and garlic,and slowly saute until all are soft, about 10-15 minutes. Add cumin, paprika, and chipotle powder, and stir until spices start to brown, 4-5 minutes. Stir in tomatoes, and simmer until sauce starts to thicken, 15-20 minutes. Add salt and pepper, and feta. Taste, and adjust seasonings to taste. Make a small well for each egg, and drop into the tomato sauce. Place the skillet on the center rack of the oven, and bake 8-10 minutes, just until eggs are set. Remove from oven, let rest for 5 minutes, then garnish with cilantro. You can add extra hot sauce at this point if you like, but it shouldn't need it. You can serve this with crusty bread or pita, but we just eat it straight out of the bowl.